I got nail mail the other day which was the full China Glaze Bohemian collection. Having nowhere local to buy it, the cheapest option was to score a set off ebay. 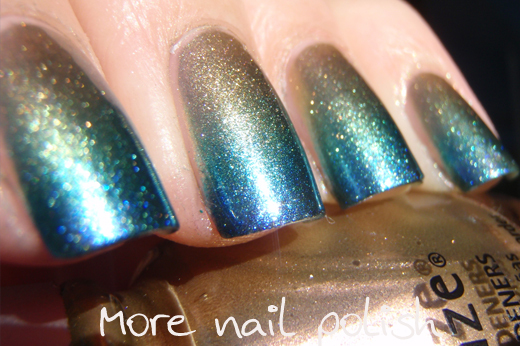 Initial swatches I saw on the collection were disappointing and I was starting to wonder whether or not I should have bought them, but then I saw Fashion Polish's swatches and PWOAR! she made them look stunning and I was glad they would arrive very soon. Rather than swatching the full collection, I thought I would try a gradient with some of the colours. I used all the colours in this gradient except the purple one - No Plain Jane. I painted onto a makeup sponge: Swanky Silk, Rare & Radiant, Unpredictable, Deviantly Daring and Want My Bawdy. I painted a single coat on my nails with Swanky Silk as the base and then sponged on the gradient with Swanky Silk near the cuticle edge and all the colours down to Want My Bawdy on the tips. The thing I especially loved about doing a sponged gradient was that I had zero brushstrokes. I also have to say that I found the duo chrome effect really quite strong with this entire gradient. On the angle it had a distinct green and teal look to it. I'm looking forward to wearing each of these, I think they are really pretty. Amazing!! That's very very very beautiful!!! So pretty! Makes me glad I bought them. 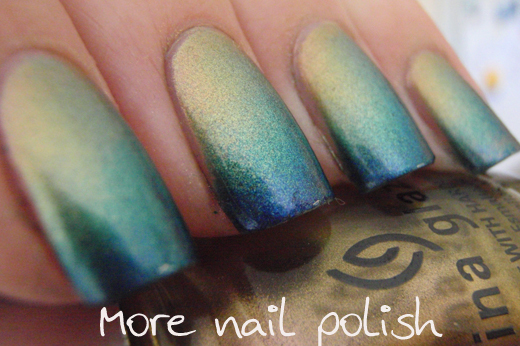 I must try a gradient, it's gorgeous. That's probably the most perfect gradient I've seen so far! Amazing! Perfect :) You're excellent at gradients! I can't believe you managed to fit about 5 colours into that gradient so flawlessly! That is so perfect and lovely - you're very clever! This is gorgeous, and such a great idea! This looks insanely awesome! 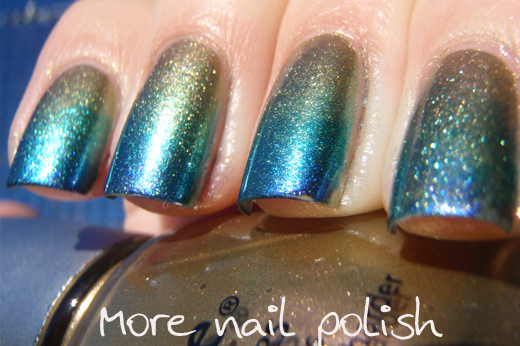 I don't think I'd have the patience to do a gradient with more than 2 polishes though. I love this! I think I'm going to need more polishes from this collection now! I painted them all onto the sponge at the same time and sponged them onto my nail in one go. 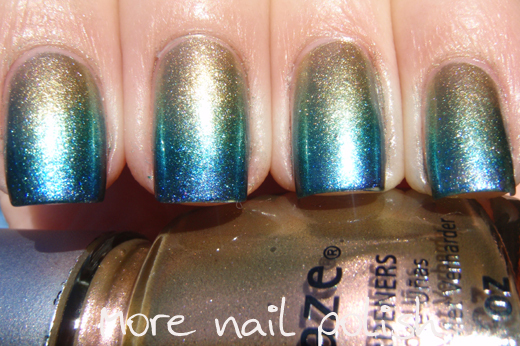 That shimmer truly rocks, what a nice and smooth gradient! 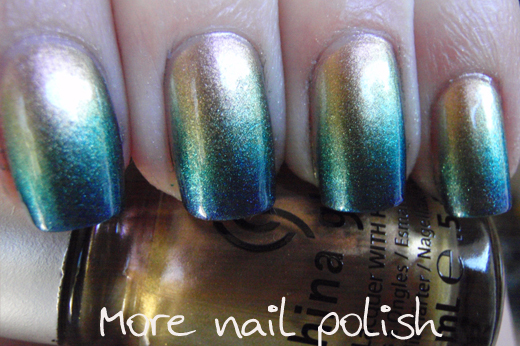 I was going to do this gradient tonight. I have swanky silk drying as I am writing this, do you mind if I do it and have the darker colors on the bottom? Holy Lord! Words cannot explain how blown away I am by this mani. I, like you, thought I didn't need to the collection either. But I think you have succesffuly changed my mind. This has amazing written all over it! What a great way to showcase the new collection rather then switches. Wow! Brilliant idea, brilliant execution! Beautiful! I love the color combo! I'd like to try doing a gradient, but I don't know how well it will turn out. This is stunning! 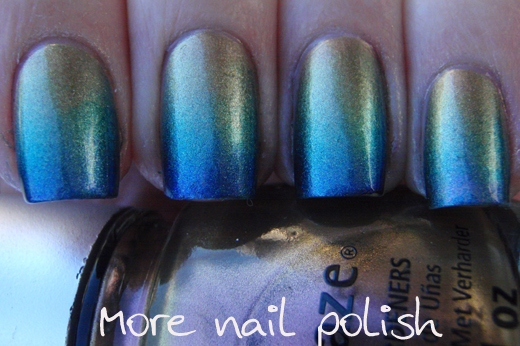 It is such a flawless gradient ♥.